Art Van Allsburg, on the far right of the picture, stands behind a wicker chair in front of the furniture store at 42 W. Leonard. 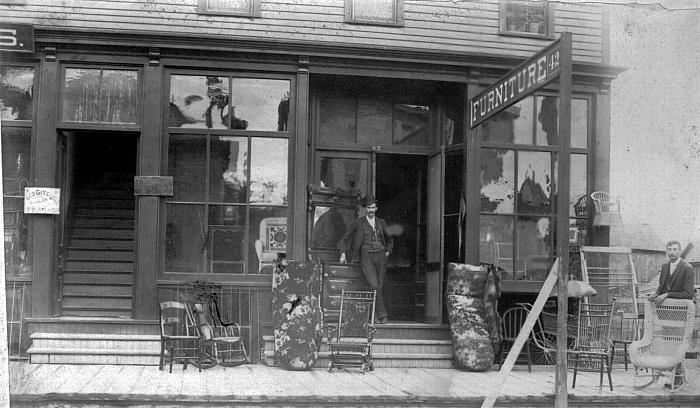 Displayed on the plank sidewalk are several styles of side chairs; a rocking chair and a platform rocker; a wicker chair is visible through the window of the shop; two chaise style sofas stand on end at either side of the door; the man in the doorway standing next to a three-drawer chest with mirror may be one of the owners; and there is a wicker baby carriage beneath the window on the right. The furniture sign, perpendicular to the building, also lists the street number. A small sign at the left of the stairs leading to the second floor advertises Geo. Gitchell who is a violin teacher. Title by cataloger. Samuel Crockett and Edward Hopkins are listed in the 1890 city directory as furniture manufacturers and dealers at 17 Canal St. and 42 W. Leonard. By 1892 they no longer appear at either location. Later Van Allsburg had his own store at 191-197 S. Division where he sold art supplies and coffins as well as furniture.